It is estimated that 30-40% of dogs in the United States are over-weight and should be on a restricted diet. Another large percentage of dogs have the correct body score, but do not require any more energy. Restricting dog food will work for losing and/or maintaining weight, but other important nutrients needed by the dog are restricted as well. 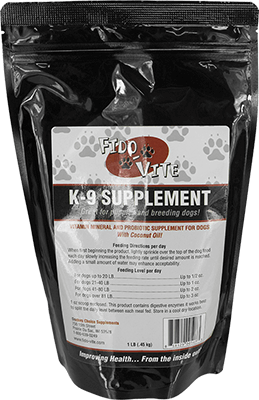 Fido-Vite puts back essential vitamins and trace minerals that diet restriction took out. Fido-Vite also improves utilization of nutrients from the dog food. Maintaining intestinal health is key to keeping the rest of the dog healthy. The intestinal tract is the largest organ in the body, giving rise to the largest surface area for the absorption and digestion of nutrients. An undernourished or unstable intestinal tract leads to poor digestion, depressed defense systems, which leads to reduction in nutrient absorption. The ingredients in Fido-Vite work together with different modes of action to insure optimal intestinal health. Start slowly - Each day increasing the feeding rate until desired level is reached. You may double the feeding rate for dogs under stress. Adding a small amount of water may enhance acceptability.